Combine red peppers and artichokes; pat dry with a paper towel. Add salt, cayenne pepper, minced garlic and chopped green onions (white part only). Mix with plain yogurt until blended. Pour into serving bowl. Sprinkle the remaining green onions over the dip. Cover and chill at least 3 hours or overnight for flavors to blend. 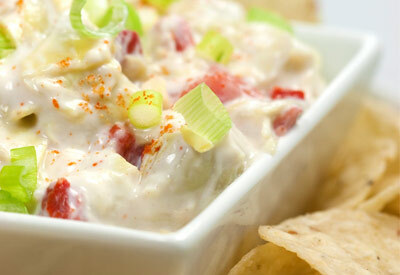 Serve with pita crisps or corn tortilla chips.